Want that radiant sun-kissed look but without the fake-tan-gone-wrong look. For a natural looking colour Bronzer is the way to go. All you need is a good quality bronzing powder & large bronzing or powder brush. However applying the right amount of Bronzer can be tricky. There is a fine line between toooooo much bronzer and the right amount. It is always better to start applying a small amount and add more if you need to. You can build on it but it is more difficult to diminish if you apply too much. Brush on your bronzer after applying your foundation. If you set your foundation with a powder use the bronzer over the powder. The E-3 method takes the guess work out the application. 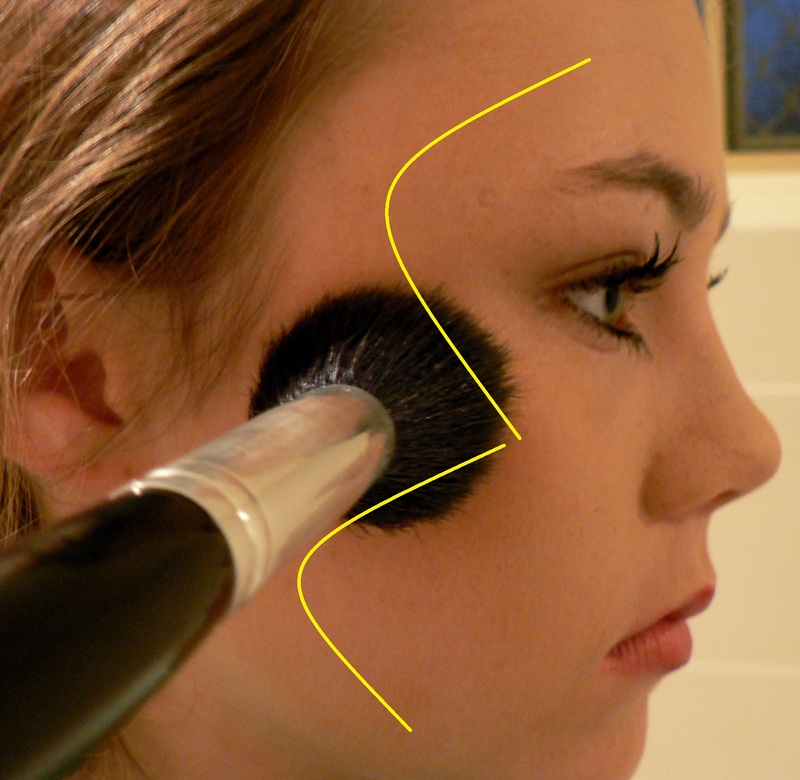 Use the brush to apply the bronzer tracing a E on one side of the face then an 3 on the other. Starting on the forehead sweep the brush down and around to the cheek to create the top half of the 3 now sweep down and around to the chin to create the bottom half of the 3. Repeat on the other side of the face. Brush a little under the jaw line to give the whole face a lift. Finish with a light sweep down the nose. For a natural bare look with a hint of healthy glow lightly apply your bronzer directly over your moisturiser add a little tinted lip gloss and you are ready to go. Years ago, I went to a divine gala dinner. The ladies were exquisite in long, colourful dresses glistening with jewels and the men looked handsome in suits with bow ties. The room was stunning with fairy lights sparkling, crystal glimmering, light music from the string quartet, gorgeous covered chairs with sashes, elegant tablecloths with runners and amazing table centres. When I found my seat l saw there were 5 glasses in my place setting. This was daunting to say the least. I was instantly intimidated. I looked down at the flatware (knives, forks and spoons) and panicked. 4 forks! 5 glasses! I am not a novice to formal dining but I was suddenly very conscious of my table manners. With a formal place setting it is easiest to remember to work your way in from both sides. 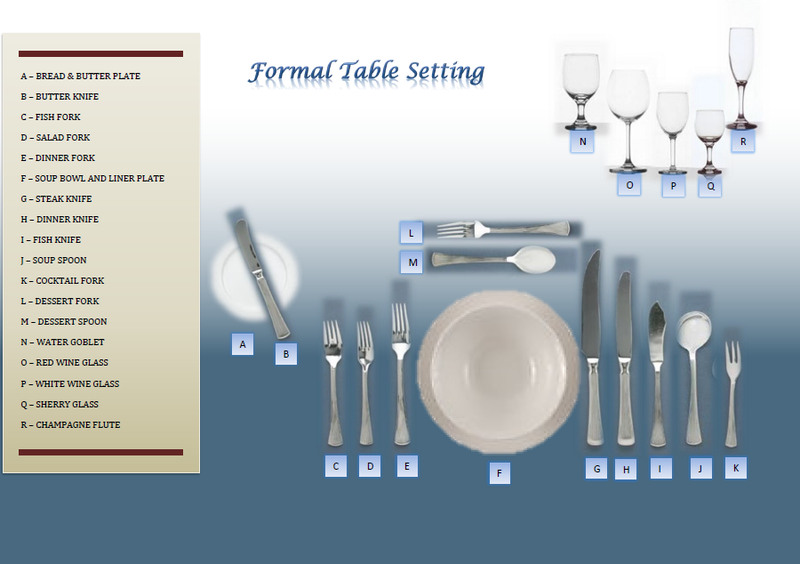 If you are setting a table for a formal occasion simply take out any flatware that does not match the courses served. For example if there is not a cocktail course or a soup course being served then these items are removed. Your salad fork should be in order of when the salad course is served. Occasionally the salad course may be after the dinner (main) course depending on the culture and what is served. Make sure all the knife blades face the plate. That weird looking knife is a fish knife. They are not sharp and are intended to flake the fish meat apart as fish does not really need cutting. Line the cutlery up so the bases are about an inch from the table edge. Bippity, Boppity, Boo and you are ready. So often we say to friends “Let’s do dinner sometime”. With all the reality-TV cooking shows for inspiration, why not host a dinner party. It can be fun and a lot more relaxing than a restaurant. It need not be a formal 7 course dinner and besides if you are like me I don’t own that much flatware. We don’t entertain often so a small dinner party for 4 with an informal setting is ideal. 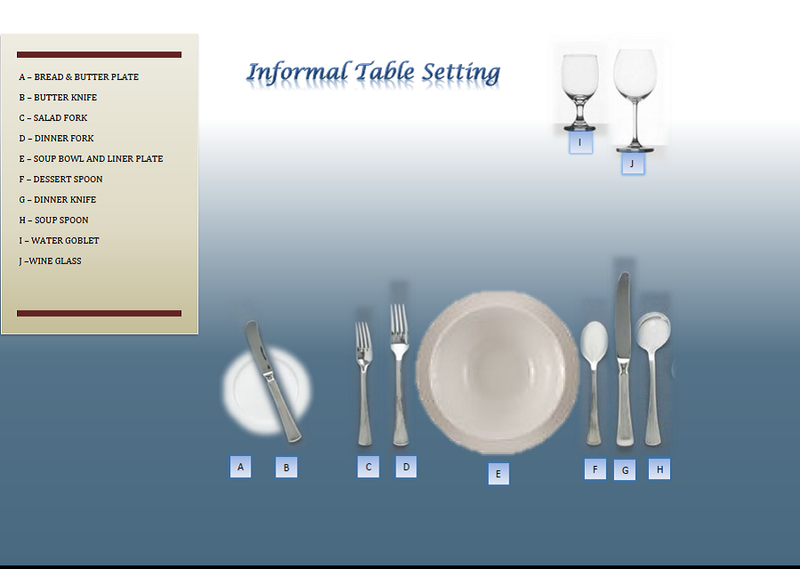 Informal table settings have fewer utensils and plates. It is easy to follow remembering the working in from the outside principle, again. If you are setting a table simply omit any cutlery that does not match the food. Ensure all the cutlery is set with an invisible base line an inch from the table edge and the knife blades turn in toward the plates. Have you ever noticed someone in pants that are too long and the hem is torn and tattered? Apart from “How untidy!”, have you thought “What a waste of a good pair of trousers”. Ideally the best answer is to find a friend who knows how to sew a blind hem and persuade them into fixing your wardrobe. This can become costly in terms of cocktails on your next night out. It is understandable that not everyone can sew but there are a couple of tricks that can save not only your image but also a pair of pants and your money. A short-term fix is double sided tape. 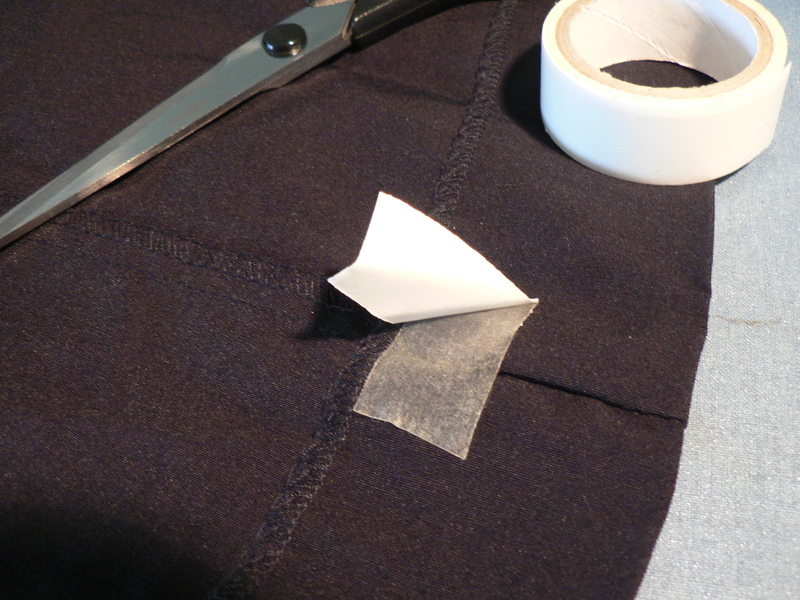 This can easily be applied to the inside between the pant leg and where the correct hem length for you would be. Shorter trousers in an instant. This is also very handy for when your skirt hem has come down and you only have 5 minutes before a meeting. Only one problem with this is if you wash in hot water it will lose its adhesive over time. The best trick I have found is iron-on webbing tape. 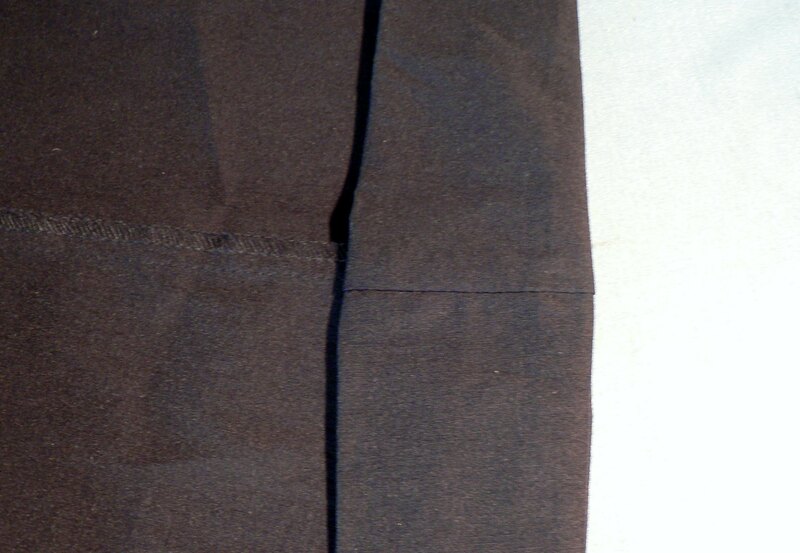 You simply trim the length you want and iron it on between the 2 layer: the pant leg and where you wish the hem to be. Just like magic. It is most important to make sure you measure the legs against each other so they are both the same length. Monumental error – one pant leg shorter than the other! Or maybe you could start a new fashion trend. Not sure it would catch on. 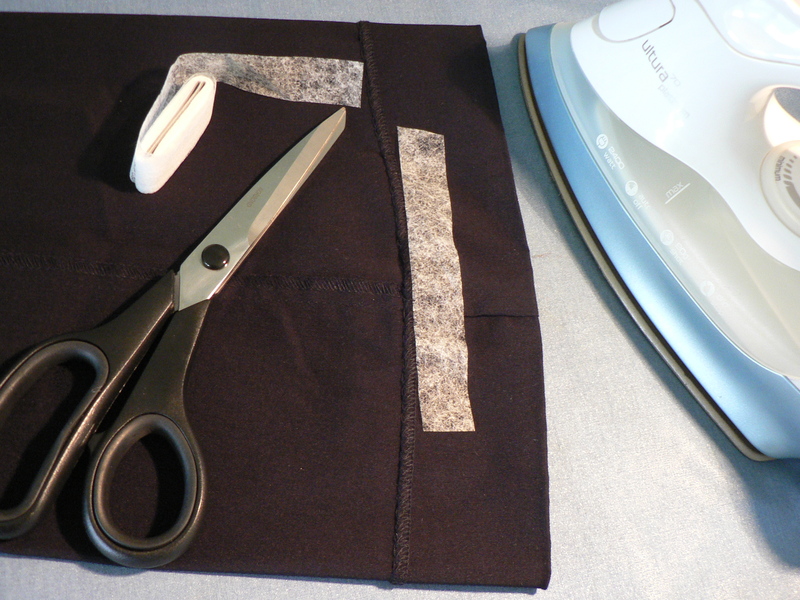 The iron-in webbing tape’s adhesive holds well under heat from both the washer and dryer. It is inexpensive and can be found in major supermarkets and fabric shops. This solution is definitely heaps cheaper and quicker than a tailor.